58280 • Tamiya TXT-1 • (Radio Controlled Model Archive) • RCScrapyard. 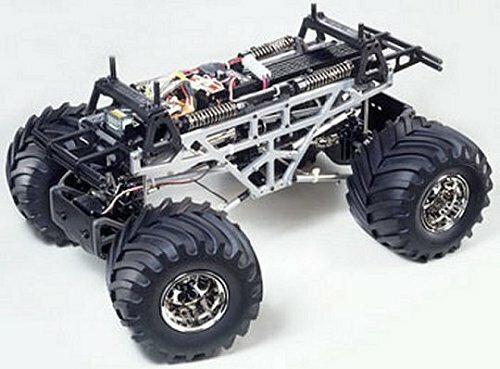 Released by Tamiya on September 27, 2001, the TXT-1 was a self assemble Radio Controlled, Twin-Motor, 4 Wheel Drive & 4 Wheel Steer Monster Truck model. The Highly Detailed lexan polycarbonate body shell was supplied already painted and in case you didn't like that one, the kit came with a spare clear one as well. The aluminium chassis consisted of two cut plates joined by a series of ties and struts making a solid rigid construction. The two silver can 540 electric motors on the centrally positioned gearbox, were mounted side by side. Two orbital gear differentials were then employed to provide drive via a universal jointed prop shaft and four splined drive shafts to the trucks huge wheels. The suspension was cantilevered with four horizontally mounted coil springs over oil filled shock absorbers. A mechanical, servo operated, three stage forward and reverse speed controller was also provided in the kit. To drive, the TXT-1 was not for beginners and required a certain amount of skill to manoeuvre. Over rough terrain the truck was amazing and able to climb just about anything. 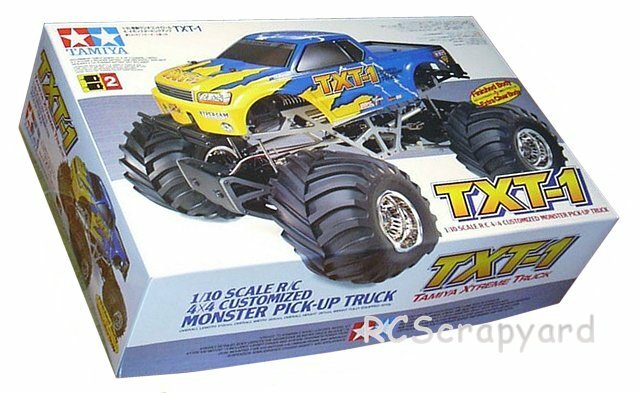 Buying a used Tamiya TXT-1 Electric Monster Truck, or any used RC Model, has a number of advantages. It is generally cheaper than new, ready built and may come with a variety of expensive hop-ups already installed. Cheap, pre-loved bargains are always becoming available. However, depending on the age of your purchase, it may need a little tender loving care before you can take it out on the back yard. If the body shell of your Tamiya TXT-1 is broken, ripped or damaged in any way, this can be easily repaired with rubber solution glue. Also, for added protection and if available for your TXT-1 model, fit an under guard to stop dirt and gravel entering the chassis. 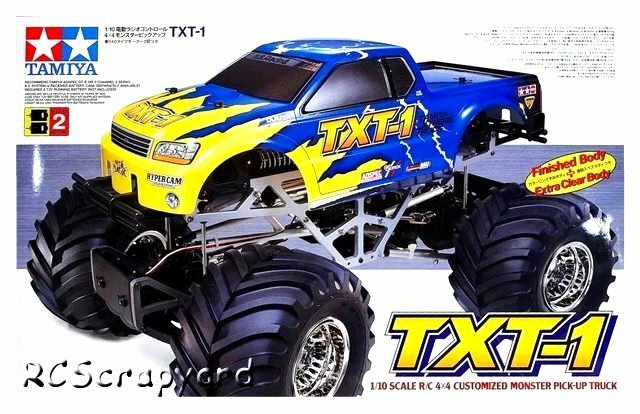 If you intend to race your TXT-1 Monster Truck model at a competitive level, I would also recommend you obtain and fit titanium pivot shafts, turnbuckles, tie rods and steering rods. The TXT-1 steering servo is also prone to damage. In high speed crash situations, the fragile gear teeth of the servo can be broken off, rendering your expensive servo useless, so be sure to obtain a good quality "Servo Saver". Check out my Servo Information article. 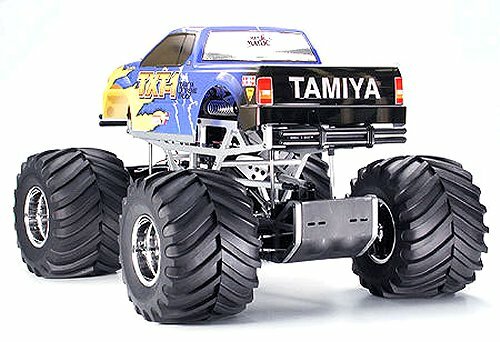 If body roll on your Tamiya TXT-1 is a problem, handling can be improved with the use of stabilizers, anti roll or sway bars, stiffer tuning springs and, or, thicker silicone oil in the dampers. Finally, good luck with your TXT-1 model and good racing. Ball differentials were developed in the late 1980s to replace the high friction Gear differentials. Mainly used on Tamiya Touring Cars, Le-Mans and Formula One Cars, Ball Differentials are designed to be totally frictionless and smooth in action to provide effortless drive to the wheels on cornering, where the inside wheels must rotate slower than the outside wheels for controlled stability. Basically, the configuration of the Ball Differential is a number of small case hardened steel balls, spaced in a plastic cage that is in effect the drive gear for the axle. On each side of the gear are two hardened and tempered pressure plates that clamp over the steel balls, held in position by a screw through the centre of the assembly, incorporating a small thrust bearing and coil spring. The adjustment of this screw is crucial to the effectiveness of the differentials action. Too tight and the free movement of the diff is restricted. Too loose and the balls will slip on the plates when accelerating out of the corner, not only reducing drive, but damaging the balls and pressure plates … not good. The optimum setting is obviously somewhere in between and is where the small coil spring is important. It must be compressed, but not fully, to provide the desired exact pressure required. With a little practise setting up the diff become second nature. Patience is the word for this procedure. Lubrication of Ball Differentials is essential for that smooth operation and special greases have been developed that allow the balls to roll freely in the cage and push aside as they roll over the pressure plates.